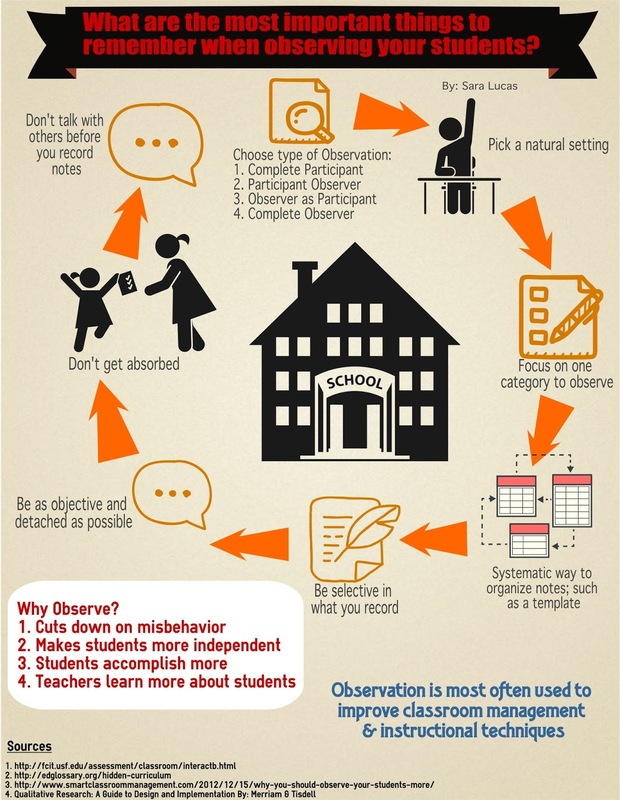 Why should observation be done in a classroom? Observation is most commonly used to improve classroom management and instructional techniques (Hidden Curriculum). It has been noted to cut down on misbehavior, make students more independent, allowing students to accomplish more, and for teachers to learn more about students . To be able to observe effectively it “requires sharp, vibrant lesson, spot on directions, and prove it to me checking for understanding before releasing students to work” (Linsin, 2015). If you don’t do this, you will be so absorbed in teaching and helping students that you would never be able to observe what is happening in the classroom. I like the way your infographic flows. It is well organized and easy to follow. I like the idea of using a template to narrow down what you are recording. I tried observing my classes yesterday while we were using clickers and I found that I was trying to focus on too many things at once. Maybe I will try using a template to make my observations more focused. I like your infographic and the pictures you used, more fun to look at :) I like the template, I'm using one in my class and it's still a little difficult for me to keep track, but I'm sure much easier than if I didn't have one. It's interesting that observation is often used to improve classroom management, my classroom management seems to be dwindling just a little because I have to get my check marks down on different categories. Maybe if my students knew I was observing and recording information it would be different, but I want them to act normal and I'm afraid if they knew I was recording information they might not behave normally. But on the other hand, maybe it helps us to really see who the kids are that are talking and what not and be able to move them away from others, because I have seen a difference in how much I actually notice that I haven't before. Nicely organized info-graphic. I wonder if observation is most often used to improve classroom behavior because classroom behavior is so important. It seems that much of what we do as teachers - not just observations - is focused on classroom management. I know that I reflect on it pretty much every day. I agree with you on observation being used for classroom behavior because it is so important. I also think that we notice it a lot more than we notice other things. If you don't have good classroom management it is easily noticeable as soon as you walk into the classroom. I also like your infographic. I had a hard time with mine, but the format of yours makes so much sense. I like how you pointed out the need to focus on one category to observe. I am definitely going to do that. I am also going to record my observations so I can stay focused on one category and then go back and watch the video to see what I missed in that category and maybe get more insight. I also like the "Why Observe" frame. It is really important to think about using observation again in the future.